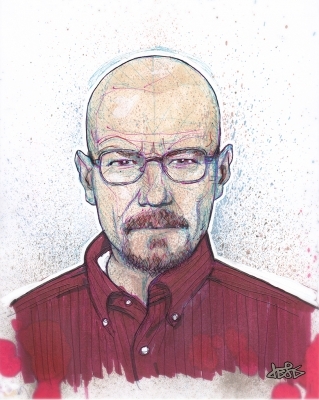 A full colour ink drawing of any character from a TV show or movie. Artwork will be made with pen, ink, markers (and possibly some finishing detail in acrylic paint) in my unique 'splatter' style on 200 gsm acid-free paper measuring approximately 8" x 12". Portrait will be based on a reference photo and will feature the face or head/shoulders of the character. No background imagery other than the aforementioned 'splatter' effect. Character will be outlined in white. 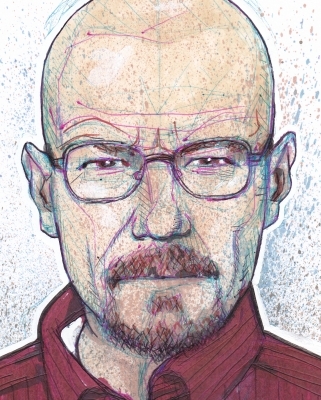 Please see my portrait of Walter White for an example. I am an artist originally from the UK and currently based in Hong Kong. I work mostly in acrylic paint, ink and traditional media. I'm influenced by lowbrow, comic and street art and make both original images and pop culture pieces inspired by music (especially hip hop), movies and videogames. Product8 x 12 face / headshot portrait of any TV character in ink on paper.